Objective: To evaluate the impact of midlife elevated serum cholesterol levels and blood pressure on the subsequent development of mild cognitive impairment (MCI) and to investigate the prevalence of MCI in elderly Finnish population, applying the MCI criteria devised by the Mayo Clinic Alzheimer’s Disease Research Center. Background: MCI has been considered as a predictor of AD. Vascular risk factors may be important in the development of cognitive impairment and AD. However, the role of vascular risk factors in MCI and the prevalence of MCI still remain virtually unknown. Methods: Subjects were derived from random, population-based samples previously studied in surveys carried out in 1972, 1977, 1982, and 1987. After an average follow-up of 21 years, 1,449 subjects aged 65 to 79 years were reexamined in 1998. Results: Eighty-two subjects, 6.1% of the population (average age, 72 years) met the criteria for MCI. Midlife elevated serum cholesterol level (≥6.5 mmol/L) was a significant risk factor for MCI (OR, 1.9; 95% CI, 1.2 to 3.0, adjusted for age and body mass index); the effect of systolic blood pressure approached significance. Conclusion: Data point to a role for midlife vascular risk factors in the development of MCI in late life. Researchers into aging-related cognitive disorders are increasingly interested in mild cognitive impairment (MCI), particularly as a means of identifying early AD. An annual conversion rate of 10% to 12% to AD in subjects with MCI has been proposed, in contrast to a conversion rate of 1% to 2% in the normal elderly population.1 Past attempts to describe MCI have been primarily clinic-based, and so far there are few studies from representative general populations; thus, the epidemiology of MCI remains largely unknown. Large, longitudinal studies are needed to investigate the prevalence of and risk factors for MCI. There is some evidence that vascular factors may be important in the development of cognitive impairment. Several cross-sectional studies have investigated the relationship between blood pressure (BP), cholesterol, and late-life cognitive function.2,3⇓ However, the results obtained from these studies remain somewhat controversial. Furthermore, a conceptual limitation of cross-sectional studies is that they cannot readily determine causality. Some longitudinal studies have pointed to a relationship between elevated BP and development of AD later in life.4-6⇓⇓ Recently, some longitudinal studies investigated the relationship between midlife BP and late-life cognitive function in nondemented subjects. These studies have described an association between elevated systolic BP (SBP) (the Honolulu-Asia Aging Study7), elevated diastolic BP (DBP) (the Uppsala Study8), both elevated SBP and DBP (the Framingham Study9), or hypertension in general (National Heart, Lung, and Blood Institute Twin Study10) at midlife and impaired cognitive performance in late life. In these studies, cognitive impairment was defined by a variety of neuropsychological tests instead of being based on clinical or diagnostic concepts. On the other hand, a recent longitudinal population-based study indicated a complex relationship between elevated BP and cognitive decline, with the results varying according to which test was used to measure cognition, and reflecting a rather minor association between BP and cognition.11 Two longitudinal studies have suggested a relationship between elevated midlife cholesterol levels and AD,6,12⇓ but there do not appear to be any longitudinal studies examining the relationship between midlife serum cholesterol levels and late-life cognitive impairment. Thus, results from published studies as to the association between vascular risk factors and cognitive impairment remain inconclusive. Furthermore, no study has investigated the relationship between midlife vascular risk factors and late-life MCI. Because MCI is considered to be an intermediate state between normal cognition in the aged and AD, it would be of interest to investigate whether the proposed risk factors for AD are also associated with MCI. Assuming that neurodegenerative processes begin at midlife,13 it would also be important to analyze the effect of putative midlife risk factors as potential targets for prevention of MCI, and ultimately, perhaps AD. In the present study, the prevalence of MCI was evaluated at the population level, applying the MCI criteria suggested by Mayo Clinic Alzheimer’s Disease Research Center (MCADRC).14,15⇓ The impact of midlife elevated cholesterol levels and BP on the subsequent development of MCI was analyzed, as well as vascular and other characteristics associated with MCI, both at prospective and cross-sectional levels. The study subjects were derived from large, population-based random samples studied within the framework of the North Karelia Project and the FINMONICA (Finnish Multinational Monitoring of Trends and Determinants in Cardiovascular Disease) study during 1972, 1977, 1982, and 1987.16 Those individuals still alive, aged 65 to 79 at the end of 1997 and living in two geographically defined areas in or close to the towns of Kuopio and Joensuu (n = 2,293), were the target of this study. From these subjects, a random sample of 2,000 persons was invited to undergo reexamination during 1998. Altogether, 1,449 subjects (72.5%) were reexamined (figure). The study was approved by the local ethics committee, and written informed consent was obtained from all participants. Figure. Formation of the study population. 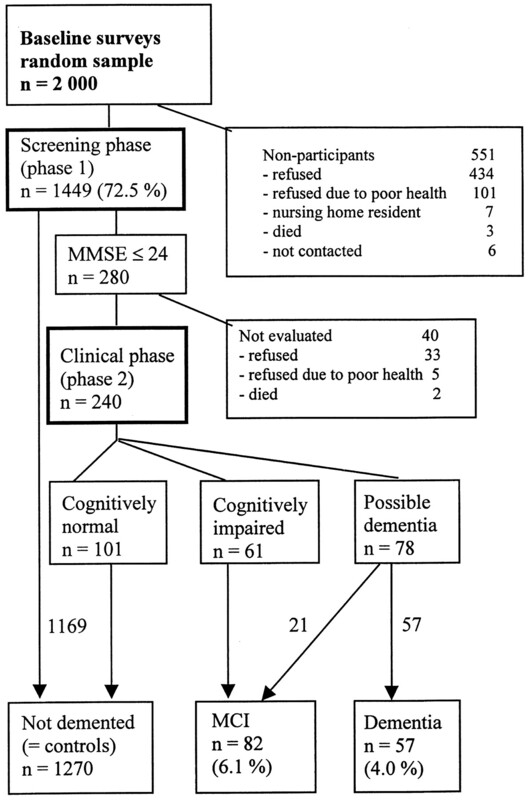 MCI = mild cognitive impairment; MMSE = Mini-Mental State Examination. The survey methods used during the midlife visit were carefully standardized and complied with international recommendations. They also followed the World Health Organization MONICA protocol in 1982 and 1987, and were comparable with methods used in 1972 and 1977. The protocol is described in more detail elsewhere.16 In brief, the survey included a self-administered questionnaire on health behavior, health status, and medical history. Subjects were queried about cerebrovascular and cardiovascular events and conditions diagnosed by physicians. Nurses specially trained for the survey checked the questionnaires to ensure that they were fully completed. Height, weight, and BP were measured. Body mass index (BMI) was calculated as weight (in kilograms) divided by height squared (in meters). Casual SBP and DBP were measured from the right arm of the subjects after they had been seated for 5 minutes. A venous blood specimen was taken to determine serum cholesterol. Serum total cholesterol was determined from frozen serum samples using the heparinmangan precipitation (Liebermann–Burchard) method in 1972 and 1977, and from fresh serum samples using an enzymatic cholesterol oxidase/p-aminophenazone (CHOD-PAP) method (Monotest, Boehringer, Mannheim, Germany) in 1982 and 1987. The enzymatic assay method gave 2.4% lower values than the Liebermann–Burchard method. Cholesterol values from the 1972 and 1977 surveys were thus corrected accordingly. All cholesterol determinations were made in the same central laboratory and the laboratory data were standardized against national and international reference laboratory values. A review board consisting of the study physician, the study neuropsychologist, and a senior neurologist (M.H.) ascertained the preliminary diagnosis based on all available information. Subjects with possible dementia were invited to the differential diagnostic phase (phase 3), which included MRI, CSF analysis, EKG, chest radiograph, and blood tests. All data accumulated from the screening and clinical phases were carefully reanalyzed by the review board before the final diagnosis was established. The diagnosis of dementia was based on the criteria of the Diagnostic and Statistical Manual of Mental Disorders, 4th ed. (DSM-IV)27 and the diagnosis of AD on the National Institute of Neurologic and Communicative Disorders and Stroke and Alzheimer’s Disease and Related Disorders Association (NINCDS-ADRDA) criteria.28 A total of 57 subjects (4%) were diagnosed as having dementia, 48 of whom had AD. The diagnostic criteria proposed by the MCADRC were used for diagnosing MCI.14,15⇓ These include 1) memory complaint by patient, family, or physician; 2) normal activities of daily living; 3) normal global cognitive function; 4) objective impairment of memory or in one other area of cognitive function as evidenced by scores >1.5 SD below the age-appropriate mean; 5) Clinical Dementia Rating score of 0.5; and 6) absence of dementia. As provided for by the MCADRC criteria, the cut-off point 1.5 SD below the norm in the neuropsychological tests was used as a guideline in the clinical assessment of cognitive performance. Thus, both psychometric and clinical aspects were taken into account in the ultimate diagnosis of MCI as suggested by the MCADRC criteria.14,15⇓ The participants who had neither dementia nor MCI formed the control group. To analyze the differences between subjects with MCI and control subjects, demented subjects were excluded from the analyses, and Student’s t-test and χ2 test were used as appropriate. Midlife serum cholesterol values were classified into high (≥6.5 mmol/L) and normal (<6.5 mmol/L). Midlife BP values were classified into three categories: normal (SBP <140 mmHg; DBP <90 mmHg), borderline (SBP 140 to 159 mmHg; DBP 90 to 94 mmHg), and high (SBP ≥160 mmHg; DBP ≥95 mmHg). The association between midlife cholesterol and BP with subsequent MCI was investigated with multiple logistic regression analyses using normal cholesterol and BP as the reference category. SBP and DBP were analyzed separately. As cholesterol and BP are influenced by age and BMI, further analyses were done controlling for age and BMI (model 2). Participants were further divided into three risk groups according to midlife SBP and serum cholesterol: 1) low risk (SBP <160 mmHg and cholesterol <6.5 mmol/L), 2) single risk factor (either SBP ≥160 mmHg or cholesterol ≥6.5 mmol/L), or 3) combined risk (SBP ≥160 mmHg and cholesterol ≥6.5 mmol/L). To investigate the combined effect of midlife hypertension and hypercholesterolemia on the development of MCI, the combined risk group was compared with both the low-risk and the single-risk-factor groups. Multiple logistic regression analyses were used to calculate OR with 95% CI. To investigate the distribution of midlife cardiovascular characteristics among demented individuals, those with MCI, and the control subjects, the demented subjects were included in the analyses, and χ2 test was used. The Mantel–Haenszel χ2 test was used as a measure of linear association between these factors. The level of significance was p < 0.05 in all analyses. Eighty-two subjects (6.1%) were diagnosed as having MCI. The proportion of women (62.1%) was equal to that in the general population in this age group in the study area (64%), and there was no significant difference between subjects with MCI and control subjects in gender (table 1). Mean follow-up time was 21 years (range, 11 to 26) and was 21 years or more for 73% of subjects (26 years for 35%; 21 years for 38%; 16 years for 16%; and 11 years for 11%). Subjects with MCI were significantly older and had a lower degree of formal education than control subjects (see table 1). At midlife, subjects with MCI had significantly higher serum total cholesterol and a trend toward higher SBP than control subjects, but at late life there was no difference in these values. Subjects with MCI had wider distribution (SD ± 23.2) in SBP values at midlife than control subjects (SD ± 19.6) (Levene’s test for equality of variances: F = 5.4, p = 0.02). There was no difference in DBP or BMI between subjects with MCI and control subjects at midlife or late life. If memory tests were used as the only neuropsychological criteria for the diagnosis of MCI, six subjects would have been excluded, leaving 76 (5.6%) in the MCI group. The characteristics and risk factors of these 76 subjects did not differ from the original MCI group. The six subjects who did not fulfill the 1.5 SD cut-off in the memory tests had, however, somewhat milder memory impairment. Cholesterol, blood pressure, and risk of MCI. Elevated serum cholesterol (≥6.5 mmol/L) at midlife was a significant risk factor for MCI in late life (table 2). There was a trend toward high SBP (≥160 mmHg) at midlife in subjects with MCI (26.8%) compared with control subjects (18.9%). However, the risk of developing MCI was not significantly higher among subjects with high SBP than that in individuals with normal SBP at midlife (see table 2). Borderline elevated SBP (140 to 159 mmHg) and elevated DBP at midlife had no effect on the risk of MCI. Subjects with combined risk factors (both SBP ≥160 mmHg and total cholesterol level ≥6.5 mmol/L) at midlife had a significantly higher risk of MCI than the low-risk group, but there was no difference in MCI risk between the combined-risk-factor group and the single-risk-factor group. Adjustment for age and BMI (model 2) did not alter these results (see table 2). Because subjects with MCI had a lower degree of formal education, all analyses were replicated including education in the multiple logistic regression. Adjustment for education, as well as smoking and alcohol consumption (data not shown), did not change the results. History of angina pectoris, myocardial infarction, and cerebrovascular symptoms (almost invariably expressed as TIA) were used as the clinical indicators of cardiovascular and cerebrovascular disease. The prevalence of angina pectoris, myocardial infarction, and cerebrovascular symptoms tended to be higher in subjects with MCI than in control subjects, but the differences between the groups were not significant either at midlife or later in life (table 3). However, subjects with MCI had more often been given a diagnosis of hypertension (information obtained from self-administered questionnaire) at midlife than control subjects, although there was no difference in antihypertensive drug treatment between the groups. At the time of the original midlife investigations, cholesterol-lowering drug treatment was not available or its use was exceptional and rare. At the late-life visit, there was no difference between the groups either in the prevalence of hypertension or the use of antihypertensive or cholesterol-lowering drugs. There was no significant difference in smoking or history of diabetes mellitus at midlife or later in life. At midlife there was no difference in alcohol consumption between the groups, but later in life the control subjects reported consuming more alcohol than did subjects with MCI. MCI diagnosis with exclusion of health problems. In the further analyses, we excluded those individuals with health problems that could have had a direct impact on cognitive function. Information about these health problems was obtained during the clinical phase, which included taking medical history and performing clinical examinations, and hospital records were also used to check the information. Ultimately, three subjects with brain ischemia, two with cerebral hemorrhage, one with PD, four with depression, two with other psychiatric illnesses, three with chronic abuse of alcohol, and three with serious systemic illness were excluded, leaving a total of 64 (4.8%) participants who met the criteria for diagnosis of MCI. The relationship between midlife cholesterol and BP and MCI after exclusion of these other health problems yielded virtually the same results (data not shown) as the overall analysis. However, the association between MCI and the combined risk factors (model 2: OR, 2.5; 95% CI, 1.1 to 5.9) and also a single risk factor (model 2: OR, 2.5; 95% CI, 1.3 to 4.7) were slightly stronger in this exclusionary analysis than in the overall analysis. Cardiovascular characteristics among demented, mildly impaired, and control subjects. Table 4 presents midlife cardiovascular characteristics among the demented, MCI, and control groups. The distribution of cholesterol, SBP, and risk factor categories differed significantly between the three groups: demented subjects most often had high cholesterol, high SBP, and combined risks at midlife and the control subjects most seldom had these characteristics. At midlife, subjects with MCI had cholesterol levels and SBP that were higher than those who remained cognitively normal but lower than those who developed dementia. Thus, subjects with MCI had a risk-factor profile that was intermediate between the demented persons and the control subjects, with a significant linear trend over the three categories (see table 4). A positive history for myocardial infarction and cerebrovascular symptoms was highest among demented subjects, second highest among subjects with MCI, and lowest among control subjects (p < 0.001 for linear trend). Comparison of participants with nonparticipants in the late-life visit showed that participants were younger (50 ± 6 versus 51 ± 6 years; p = 0.007), more educated (8.4 ± 3.5 versus 5.4 ± 1.8 years; p < 0.001), and had lower BMI (26.6 ± 3.7 versus 27.2 ± 4.5 kg/m2; p = 0.002). They did not differ significantly in gender, smoking, alcohol consumption, use of antihypertensive medication, or prevalence of angina pectoris, myocardial infarction, cerebrovascular symptoms, or diabetes mellitus at midlife (results not shown). At midlife, nonparticipants had had higher SBP (150 ± 22 versus 144 ± 20 mmHg; p < 0.001), DBP (92 ± 11 versus 89 ± 11 mmHg; p < 0.001), and serum total cholesterol (7.0 ± 1.3 versus 6.7 ± 1.2 mmol/L; p < 0.001) compared with those attending the late-life visit. By applying the MCADRC criteria, we found a 6.1% prevalence of MCI in subjects aged 65 to 79 years in this population-based study. After exclusion of other health problems that may have had a direct impact on cognitive function, the prevalence of MCI was 4.8%. Importantly, high serum cholesterol levels at midlife were found to increase the risk of MCI. Furthermore, subjects with MCI tended to have higher SBP at midlife than control subjects, and the distribution of SBP values was also wider among MCI than control subjects, but ultimately high midlife SBP only approached significance as a risk for MCI. Of subjects with MCI, 61% had had either elevated serum cholesterol or high SBP at midlife. Our previous study of subjects in the same area found that both elevated SBP and high cholesterol at midlife increased the risk of AD.6 Although the midlife cholesterol levels and SBP of the subjects with MCI were higher than the control subjects, they were less abnormal than values in those individuals who developed dementia. Thus, with respect to these midlife vascular risk factors, subjects with MCI appear to be distinct from (and intermediate between) subjects with dementia and cognitively normal individuals. Our study setting (a population-based, longitudinal study with a large cohort of subjects), the relatively high response-rate, and our three-phase study protocol to diagnose MCI and dementia increase the credibility of these findings. However, there are several reasons why the present results may underestimate the true prevalence of MCI in this population. We subjected only subjects scoring ≤24 on the MMSE to a full diagnostic evaluation. It is likely that some instances of MCI may have escaped detection at this threshold. It is also probable that, because of selection bias, our study participants had lower rates of MCI than the full population including nonparticipants.29 In this context, it is noteworthy that nonparticipants had higher prevalence of both systolic hypertension and hypercholesterolemia than participants at midlife follow-up. The MCADRC criteria for MCI excluded those subjects with health problems that may have an impact on cognitive function. However, to investigate significant health-related contributors to the diagnosis of MCI at the population level, we included also subjects with some health problems in the main analysis. There was no significant difference in the prevalence of cardiovascular or cerebrovascular diseases between subjects with MCI and control subjects. Importantly, exclusion of other health problems did not diminish the association between midlife high cholesterol and late-life MCI and the tendency between midlife high SBP and late-life MCI, but rather strengthened the effect of these risk factors. If the group of subjects with MCI remaining after exclusion of other health problems is thought to represent the real, more homogenous group predictive for AD, these findings provide further support for the view that hypercholesterolemia earlier in life predicts the development of cognitive impairment. The role of high SBP remains controversial, but the results of this and our recent study suggest that high SBP is also associated with the development of cognitive impairment. Even though midlife BP values did not differ significantly between the subjects with MCI and control subjects, the former more often reported a diagnosis of hypertension at midlife, supporting the association between these conditions. The precise mechanisms by which vascular risk factors are related to cognitive impairment or AD remain unknown at the moment. Hypercholesterolemia and hypertension are thought to increase the risk of cognitive impairment and dementia by inducing atherosclerosis and impairing blood flow, but they may also directly affect neurodegeneration relevant to AD.30,31⇓ The possible biologic mechanisms whereby elevated serum cholesterol may cause cognitive decline are of interest. Longstanding hypercholesterolemia may lead to intima thickening and weakening of endothelial functions in cerebrovascular arterioles and capillaries and these changes may impair brain metabolism.32 Cholesterol has also been shown to have an effect in cell culture on metabolism of the amyloid precursor protein.33 Furthermore, depletion of intraneuronal cholesterol has been reported to inhibit β-amyloid production in vitro34 indicating that increased cholesterol levels could accelerate the production of β-amyloid, the accumulation of β-amyloid plaques, and the development of AD. The dose-response relationship between elevated cholesterol and SBP at midlife and severity of cognitive decline in late life deserves some discussion. We observed that subjects diagnosed with MCI appeared to be distinct from and intermediate between subjects with dementia and cognitively normal subjects with respect to midlife cholesterol and SBP values. At midlife, subjects with MCI had cholesterol and SBP levels that were higher than those of control subjects but lower than those who developed dementia. This graded association relationship may indicate a causal relationship between elevated cholesterol and SBP and the severity of cognitive impairment. As the proportion of elderly in the population increases, AD will become an enormous public health problem. Interventions that might delay disease onset, even if only modestly, would have huge benefits from the public health point of view.35 The observed relationship between high midlife cholesterol and late-life MCI and the tendency between high midlife SBP and late-life MCI may have implications for prevention of MCI and AD, because both hypercholesterolemia and hypertension are amenable to nonpharmacologic and pharmacologic treatments. Our findings that midlife cardiovascular risk factors can influence the development of MCI need to be confirmed in other epidemiologic studies. Supported by Academy of Finland grants 37573, 63645, and 48138, and EVO grant 477268. The authors thank Veli Koistinen and Veikko Jokela for statistical help and Liisi Saarela for technical assistance. Petersen RC, Smith GE, Waring SC, et al. Mild cognitive impairment. Arch Neurol . 1999; 56: 303–308. Viitanen M, Guo Z. Are cognitive function and blood pressure related? Drugs Aging . 1997; 11: 165–169. Breteler MM, Bots ML, Ott A, et al. Risk factors for vascular disease and dementia. Haemostasis . 1998; 28: 167–173. Skoog I, Lernfelt B, Landahl S, et al. 15-year longitudinal study of blood pressure and dementia. Lancet . 1996; 347: 1141–1145. Launer LJ, Ross GW, Petrovitch H, et al. Midlife blood pressure and dementia: the Honolulu-Asia Aging Study. Neurobiol Aging . 2000; 21: 49–55. Kivipelto M, Helkala E-L, Hallikainen M, et al. Elevated systolic blood pressure and high cholesterol levels at midlife are risk factors for late-life dementia. Neurobiol Aging . 2000; 21 (suppl 1): S174.Abstract. Launer LJ, Masaki K, Petrovitch H, et al. The association between midlife blood pressure levels and late-life cognitive function. JAMA . 1995; 274: 1846–1851. Kilander L, Nyman H, Boberg M, et al. Hypertension is related to cognitive impairment; a 20-year follow-up of 999 men. Hypertension . 1998; 31: 780–786. Elias MF, Wolf PA, D’Agostino RB, et al. Untreated blood pressure level is inversely related to cognitive functioning: the Framingham Study. Am J Epidemiol . 1993; 138: 353–364. Carmelli D, Swan GE, Reed T, et al. Midlife cardiovascular risk factors, ApoE, and cognitive decline in elderly male twins. Neurology . 1998; 50: 1580–1585. Glynn RJ, Beckett LA, Hebert LE, et al. Current and remote blood pressure and cognitive decline. JAMA . 1999; 281: 438–445. Notkola I-L, Sulkava R, Pekkanen J, et al. Serum total cholesterol, apolipoprotein E 4, and Alzheimer’s disease. Neuroepidemiology . 1998; 17: 14–20. Braak E, Griffing K, Arai K, et al. Neuropathology of Alzheimer’s disease: what is new since A. Alzheimer? Eur Arch Psychiatry Clin Neurosci . 1999; 249 (suppl 3): 14–22. Smith GE, Petersen RC, Parisi JE, et al. Definition, course, and outcome of mild cognitive impairment. Aging Neuropsychol Cogn . 1996; 3: 141–147. Petersen RC, Smith GE, Ivnik RJ, et al. Apolipoprotein E status as a predictor of development of Alzheimer’s disease in memory-impaired individuals. JAMA . 1995; 273: 1274–1278. Vartiainen E, Puska P, Jousilahti P, et al. Twenty-year trends in coronary risk factors in North-Karelia and in other areas of Finland. Int J Epidemiology . 1994; 23: 495–504. Folstein MF, Folstein SE, McHugh PR. “Mini-Mental State”: a practical method for grading the cognitive state of patients for the clinician. J Psychiatr Res . 1975; 12: 189–198. Buschke H, Fuld PA. Evaluating storage, retention, and retrieval in disordered memory and learning. Neurology . 1974; 24: 1019–1025. Wechsler D. Wechsler Memory Scale–Revised manual. San Antonio: The Psychological Corporation, 1987. Kaplan E, Goodglass H, Weintraub S. The Boston Naming Test. Philadelphia: Lea and Febiger, 1983. Wechsler D. WAIS-R Manual. New York: Psychological Corporation, 1981. Borkowski JG, Benton AL, Spreen O. Word fluency and brain damage. Neuropsychologia . 1967; 5: 135–140. Goodglass H, Kaplan E. The assessment of aphasia and related disorders. Philadelphia: Lea and Febiger, 1972. Nelson HE. A modified card sorting test sensitive to frontal lobe defects. Cortex . 1976; 12: 313–324. Reitan RM. Validity of the Trail Making Test as an indicator of organic brain damage. Percept Mot Skills . 1958; 8: 271–276. Berg L. Clinical Dementia Rating (CDR). Psychopharmacol Bull . 1988; 24: 637–639. American Psychiatric Association. Diagnostic and Statistical Manual of Mental Disorders. 4th ed. Washington: American Psychiatric Association, 1994. Launer LJ, Wind WA, Deeg DJH. Nonresponse pattern and bias in a community-based cross-sectional study of cognitive functioning among the elderly. Am J Epidem . 1994; 139: 803–812. Skoog I, Kalaria RN, Breteler MMB. Vascular factors and Alzheimer disease. Alzheimer Dis Assoc Disord . 1999; 13 (suppl 3): 106–114. Carmelli D, Swan GE, Reed T, et al. Midlife cardiovascular risk factors and brain morphology in identical older male twins. Neurology . 1999; 12: 1119–1124. Levine GN, Keaney JF, Vita JA. Cholesterol reduction in cardiovascular disease. Clinical benefits and possible mechanisms. N Engl J Med . 1995; 323: 512–521. Bodovitz S, Klein WL. Cholesterol modulates α-secretase cleavage of amyloid precursor protein. J Biol Chem . 1996; 271: 4436–4440. Simons M, Keller P, De Strooper B, et al. Cholesterol depletion inhibits the generation of beta-amyloid in hippocampal neurons. Proc Natl Acad Sci U S A . 1998; 95: 6460–6464. Brookmeyer R, Gray S, Kawas C. Projections of Alzheimer’s disease in the United States and the public health impact of delaying disease onset. Am J Public Health . 1998; 88: 1337–1342.